Could this be real? It’s a bike path above the traffic. Well, why not? If Minneapolis can build a complex system of second-floor skyways that allowed me to walk to work without a coat in deep winter 1997, why not? Ben Schiller at FastCoExist explains. “In most cities, cycling infrastructure isn’t much more than a few dotted lines on the road. But that’s not how it is in the Netherlands, one of the world’s most cycle-friendly nations. Dutch cities have dedicated lanes that separate cars and bikes, making cycling an activity for young and old, female and male–not just the adventurous few. “A good example is [an] elegant circular bridge in Eindhoven, in southern Holland. Called the Hovenring, it lets cyclists completely avoid other road users and cross the busy A2 highway with minimal fuss. It also makes for better road flow, according to Gerhard Nijenhuis, an employee at IPV Delft, the firm that designed it.” Read more. In the Netherlands, bikers ride on top of this rotary. You may get a kick out of this BBC story on the intersection of art and engineering. “Artist Daan Roosegaarde has teamed up with Hans Goris, a manager at a Dutch civil engineering firm with hopes of reinventing highways all over the world. 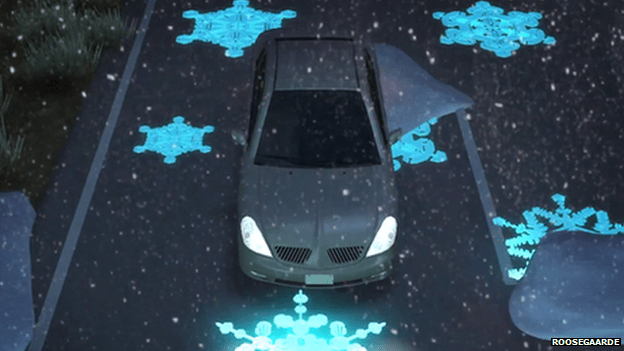 “They are working on designs that will change with the weather — telling drivers if it’s icy or wet by using high-tech paint that lights up in different temperatures. “Another of their ideas is to create a road that charges up electric cars as they drive along it. “In the past he has designed a dance floor with built-in disco lights powered by dancers’ foot movements.